The M01 on the DS: one to get iPhone owners jealous? 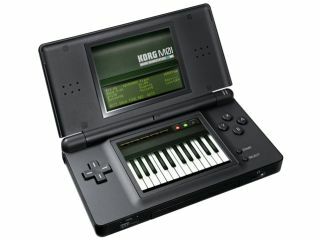 The Korg M01 is a new Nintendo DS version of Korg's M1 Workstation that comes courtesy of AQ Interactive. This is the same company that did such a fine job with the Korg DS-10, an emulation of Korg's classic MS-20 synth. The M1 was hugely popular in the late '80s and early '90s, and the 8-part multitimbral, 12-note polyphonic DS version will feature all of its PCM data, giving you 300 sounds. There's an 8-track/16-step sequencer, a master effect (either reverb or delay), and various editing windows, while data can be exchanged wirelessly between DSs. The M01, then, could be a genuine DS workstation - it'll be released in Japan in December, and hopefully in the rest of the world at some point after that.